J-Live - How Much Is Water? In an age of slammin’ superhero crossovers, get ready for a Hip-Hop team-up to beat them all: Slimkid3 & DJ Nu-Mark! With the Delicious Vinyl release of their album-length eponymous collaboration, the legendary Pharcyde MC and Jurassic 5 DJ/producer have created a soulful Hip-Hop soundtrack for the ages. Ever since his time as a founding member of The Pharcyde, Slimkid3 has stood out for his relationship raps, both warm-hearted and coolly observant. As an innovative member Jurassic 5, DJ Nu-Mark has long propelled golden era sounds into the future. "Ding ding! True school is in session!" trumpeted okayplayer.com when Tre & Nu-Mark released their freebie EP Another Day, Another Dollar in 2011. The duo knew they were onto something good, and re-upped to create new music. The new album's standout tracks include "Bouillon" featuring Del and Murs, "King" featuring Diamond D, reggae-fueled summer jam "Bom Bom Fiya" and "I Know, Didn't I" a savvy flip of Darondo's soul classic. 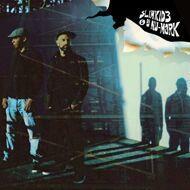 Single releases from Slimkid3 & DJ Nu-Mark will come on 45rpm vinyl 7-inch format. Slimkid3 & DJ Nu-Mark will be performing together through the end of 2014. See you there!